LAS VEGAS--(BUSINESS WIRE)--ZAGG Inc (NASDAQ: ZAGG), a leading mobile device accessories company with a brand portfolio that includes ZAGG and iFrogz, introduced two new keyboard accessories for the Apple® iPad® mini. The ZAGGkeys™ Cover and ZAGGkeys™ Folio are ultra-thin Bluetooth® keyboard accessories built with a unique, patent-pending hinge system that enhances the iPad mini user experience with a full range of viewing angles up to 135 degrees. The new designs were unveiled at ZAGG’s booth at CTIA 2013. The new ZAGGkeys Cover is the most versatile Bluetooth keyboard on the market and the thinnest at just 6.3mm. It features a unique hinge that lets users position the screen at virtually any viewing angle as well as reverse the iPad mini for a convenient, one-piece reading and playing mode. The ZAGGkeys Cover also features backlit keys in seven color options and three lighting levels. A powerful battery keeps the Cover going for up to three months of normal use before it needs to be charged, while a magnetic closure protects the screen during transport. The ZAGGkeys Cover will be available in both silver and black, matching the back finish of the iPad mini. It is expected to retail for $99.99. At only 6.9mm thin, the new ZAGGkeys Folio is the thinnest and most diverse Bluetooth® keyboard/case combo available. It also features the patented hinge that allows users to position the screen at virtually any viewing angle, as well as backlit keys in seven colors and three lighting levels. 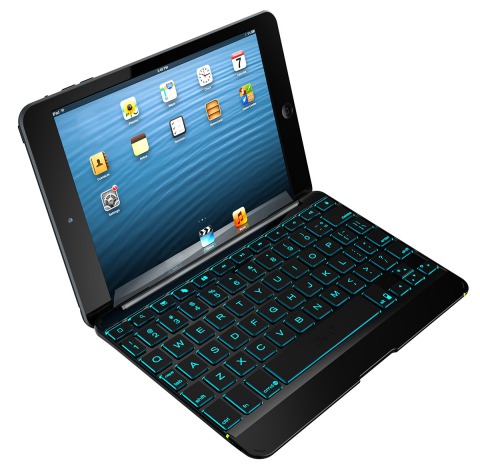 In addition, the ZAGGkeys Folio provides full body protection to help keep an iPad free from scratches and dings. The keyboard’s powerful battery lasts for up to three months of regular use between charges. The ZAGGkeys Folio initially will be available in black and white, with new colors rolling off the production line by fall. The accessory has a suggested retail price of $99.99. The ZAGGkeys Cover and ZAGGkeys Folio are the latest in a line of ZAGG’s innovation within the tablet keyboard accessories category. In 2010, the company was a leading pioneer of Bluetooth-enabled keyboards designed to enhance tablet productivity for users. Since then, ZAGG has been on the leading edge of innovation by introducing new features like its intuitive channel tablet stand as well as island-style and special function keys that have become an industry standard. ZAGGkeys Cover and ZAGGkeys Folio are expected to be available online and through select retail partners by early summer. For a sneak peek, interested visitors to CTIA can meet the ZAGG team and see the new keyboard designs at booth #1150. For more information about ZAGG, its brands and its product portfolio, visit ZAGG.com. ZAGG Inc and its subsidiaries (collectively, the "Company", or "ZAGG") design, produce, and distribute creative product solutions for mobile and media accessories such as protective coverings, cases, keyboards, keyboard cases, earbuds, portable power, and device cleaning under the family of ZAGG brands. In addition, the Company designs, produces, and distributes cases, Near-Field Audio™ amplifying speakers, earbuds, traditional headphones, and gaming headphones for mobile and media devices under the family of iFrogz brands in the value-priced lifestyle sector. ZAGG distinguishes itself as the preferred brand by offering creative product solutions through targeted global distribution channels, with the broadest product offering in its sector. More information about the company and its brands is at www.ZAGG.com. ZAGG Inc introduces two new ultra-thin Bluetooth® keyboard accessories built with a unique, patent-pending hinge system for the Apple iPad mini.